On Friday May 27th, presidential candidate Donald J. Trump held a fascist rally at the San Diego Convention Center. People from all over San Diego joined multiple protests to reject his politics. A well organized march called by Unión del Barrio rejecting Trump’s colonialism (racism) and hateful campaign descended from the historically working class community of Barrio Logan. After most protests were gone from the Convention Center, the people’s right to protest was declared an unlawful assembly by SDPD and the remaining anti-Trump protesters people were repressed and pushed into Barrio Logan with heavy military gear and vehicles. 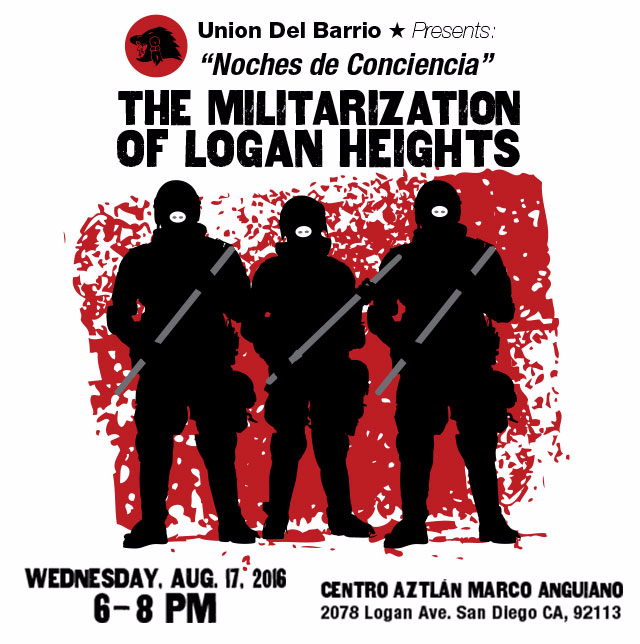 Join us in a community discussion about the militarization of Barrio Logan and the criminalization of political protest. Wednesday, August 17, 2016 – 6:00 – 8:00 p.m.
San Diego Noches De Conciencia are monthly community discussions on different topics that range from current events, know your rights, and political education. These discussions are free and open to the public. For more information about our Noches de Conciencia, or to find out about the community work of Unión del Barrio in San Diego please email: <info_sd at uniondelbarrio dot org> or follow us on social media. This entry was posted in 2016, Barrio Youth News & Events, Event, Local Community News & Events, Police & Migra, San Diego News & Events. Bookmark the permalink. ← WHY SHOULD YOU JOIN UNION DEL BARRIO?